​​​​​​​Just as cheesy and kid-friendly as the original, this Dump-and-Bake Healthy Chicken Parmesan is an easy dinner with no prep work! Just place all of the ingredients in one dish and let the oven do the work! Spray a large baking dish (about 9-inch by 13-inch) with cooking spray. Spread half of the marinara sauce in the bottom of the dish. Add the chicken on top of the sauce. Sprinkle chicken with Italian seasoning, salt, and pepper, to taste. Pour remaining sauce over chicken. Cover with foil and bake for 20 minutes. If you are using larger chicken breasts you will need to increase the baking time to at least 30-35 minutes. Remove foil, place mozzarella slices and grated Parmesan on top of chicken. Return chicken to the oven (uncovered) for an additional 10 minutes, or until cheese is melted and chicken reaches an internal temperature of 165 degrees F.
Cooking for Two? Cut the ingredients in half and bake the chicken in an 8-inch or 9-inch square baking dish. Want to prep ahead? Place all of the ingredients in the dish, cover, and refrigerate until ready to bake. You can also freeze the dish (before baking) for up to 3 months -- just make sure that it's wrapped tightly to prevent freezer burn. Have some extra marinara sauce on hand to serve over pasta or zucchini noodles, if desired. For a quick cooking time, be sure to use smaller chicken breasts (about 4-5 ounces each) or cut your large chicken breasts in half. Allow the dish to rest for 5-10 minutes before serving. This will allow the sauce to thicken a bit more and the chicken will retain its juices. 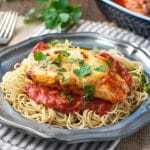 Serve the chicken parmesan bake as a low-carb meal and skip the pasta. A side salad is nice option! Serve the cheesy baked chicken on toasted hoagie rolls to make Chicken Parm Subs. Plate the chicken over pasta with additional marinara for a traditional meal, or pair the chicken parmesan with zucchini noodles for a light, grain-free substitute.